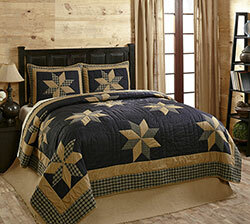 The Henry Quilt features a features patchwork 8-point stars in navy blue and deep khaki tan plaids and checks, on a solid navy blue background. The Deluxe Burlap Collection is a soft, cotton woven burlap in a natural jute tan color. 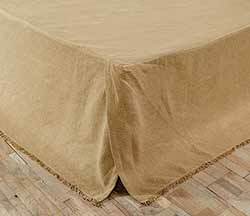 This is for the Bed Skirt, available in Twin, Queen, or King size. This beautiful country quilt features patchwork 8-point stars in navy blue and deep khaki tan plaids and checks, on a solid navy blue background.